Freediving: No tanks, just one breath! 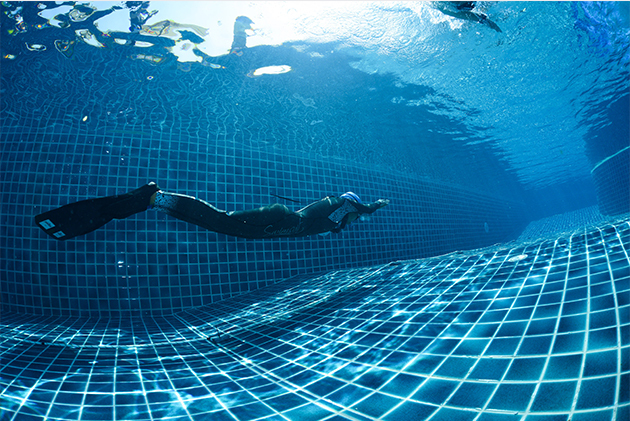 Azua holding her breath while swimming in the pool to complete the 130m underwater 'Pool Dynamic with Fins' category at the recent Andaman Freediving Challenge 2015 in Koh Lanta, Thailand. SILENCE surrounds her and all she could hear is the sound of her heart beating, as it starts to slow down. The clock is still ticking; Syafidatul Azua Shafii has been underwater for three minutes without the assistance of an oxygen tank, longer than human beings could normally do. Her abdomen muscles start to contract, indicating the need for oxygen. But she held her breath longer, till after four minutes and five seconds when she finally reached out for air. For national record holder for freediving, Syafidatul, fondly known as Azua, it was not the longest time she had held her breath. Her personal record is five minutes and 16 seconds. "When I am underwater, I feel calm and peaceful. I do not think about anything else, as I need to be completely relaxed in order to stay in the water longer," Azua told Astro AWANI after a freediving media briefing, where she gave a demonstration of her astounding ability to hold her breath. Freediving is a form of underwater diving free from equipments, relying on the divers' ability to hold their breath without the use of a breathing apparatus such as scuba gear. According to the 30-year-old, freediving is about being free and keeping the mind at ease. "The irony of freediving is that, although it is an extreme sport, you really need to control your relaxation. If you feel anxious, your heart will beat faster and your body will use up more oxygen. "For freediving, the more relaxed you are, the longer you can hold your breath, the deeper and further you can go," said Azua who is also Malaysia's first freediving instructor recognised by world-renowned diving body Scuba Schools International. Since she started freediving in 2012, Azua has five records under her belt including going into the depth of 40m by free immersion, a freediving technique using a rope to ascend and descend. Azua ascending from 40m depth at the Andaman Freediving Challenge 2015 with two safety freedivers (in camouflage wetsuits), making sure all safety measures adhered to during the extreme challenge. She established the national record of swimming 130m underwater, in the "Pool Dynamic with Fins" discipline at the recent Andaman Freediving Challenge 2015 where she also won first place in the female category. The discipline requires a freediver to travel in a horizontal position underwater while attempting to cover the greatest possible distance, in a single breath. For the scuba diver turned freediver, Azua's curiosity pushed her to test her limits underwater. "Usually in competitions, athletes tend to be obsessed with numbers and records, which can be a limiting factor to their performance. For me, I just follow what my body feels. "I will push my limits to how far I can go, but if I'm too obsessed with the numbers of how long I should stay underwater, it can limit me, or worse, cause me to blackout," she said. Just like any extreme sport, freediving has its risks. One of the most common is having a blackout from the lack of oxygen. Or even worse, death. "My biggest concern is when people don't know the risks of freediving, and when they freedive alone, something bad happens, nobody is around to help them. "The very basic rule of freediving is, never dive alone," Azua said. 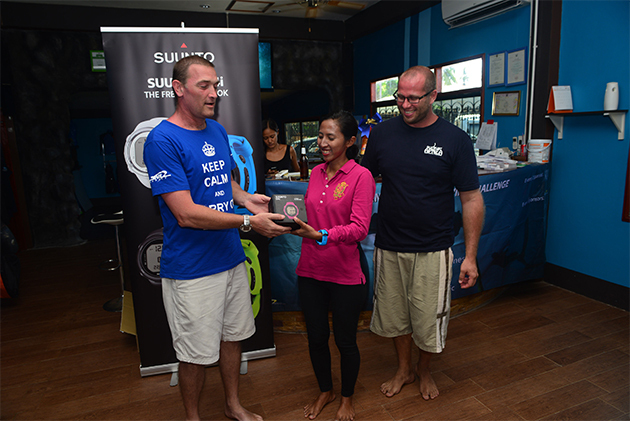 Carl Webb (left) from Dive Supply, the sponsor of Andaman Freediving Challenge 2015, presenting Azua with the top prize for winning the 130m underwater 'Pool Dynamic with Fins' category in the competition while organiser Benjamin Unal (right) of Blueplanet looks on. Freediving offers a spectacular experience of diving where it allows the diver to see marine life such as whales and dolphins without scaring them away. "Compared to scuba divers, freedivers do not let off bubbles, therefore they are quieter. In fact, the marine life might even let you get close as they tend to be more curious when they see you," Azua explains. The fact that human beings can dive to such depths on a single breath is nothing short of amazing. "Sometimes we forget we are mammals too, like whales, dolphins, penguins, and look at how they can dive and stay underwater for so long. We humans do share the same functions as these marine lives," she said. However, it takes months and years to be a professional freediver, pushing the limits of what humans thought they could not do underwater. 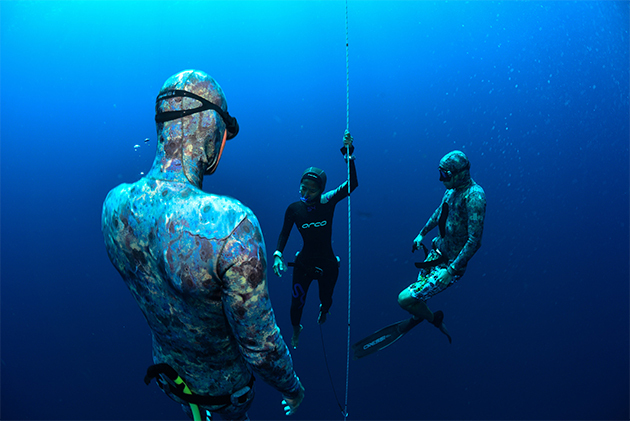 Herbert Nitsch, the current freediving world record champion, was dubbed “the deepest man on earth” when he set a world record in the "No Limits" discipline at the depth of 214 meters. Meanwhile, four-time world champion freediver, Stig Åvall Severinsen, set a record of "longest time breath held voluntarily" by Guinness World Records for holding his breath for 22 minutes! As for me, having tried out the freediving experience with Azua, my personal record, is 33 seconds.